Interior or exterior painting is among the lower-priced improvements, and can often afford nearly 100% return on investment. The colours you choose for your home when you’re living in it might be much bolder or daring than what suits the average buyer. When selling think neutrals. Be conscious of other elements around your home when choosing paint colours – things like cabinets, railings and flooring that you don’t want to change just because of a paint choice. You want to see the big picture and once again, this is where a home stager will prove invaluable. In more modern homes greys tend to work really well, but in older homes ‘greige’ often works well. Greige is a colour between beige and grey. And there’s way more than 50 shades of grey – picking a grey that doesn’t have a mauve or blue tint can be hard for some people. One of my go to grey colours that I find to be a ‘true’ grey is CIL Silver cloud and one shade darker is Sutton Place. 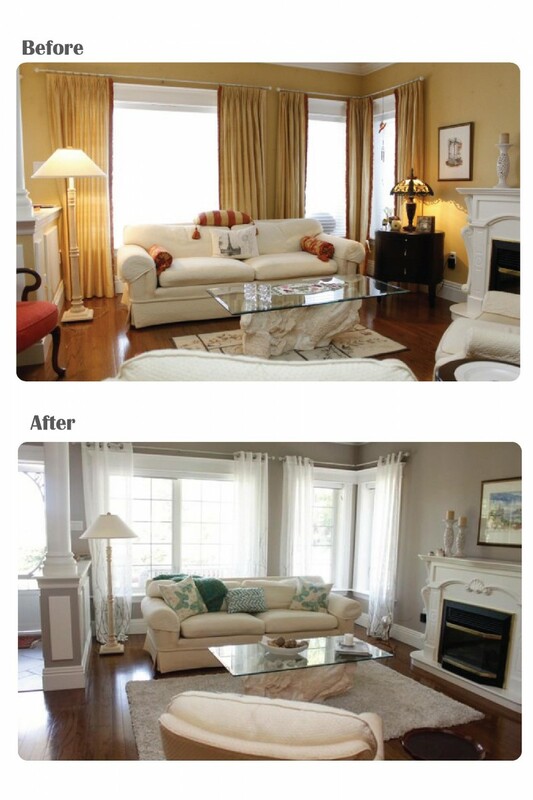 Here’s a great example of how a neutral paint colour made a huge impact on the room. Other small changes were made, such as removing some of the furniture, hanging different drapes, de-cluttering, and brining in a different, more up to date accent colour. It can be helpful to bring home paint swatches and look at them at different times of the day and under various lighting. Lighting and angles can significantly change the way paint looks on a wall. Most paint suppliers these days offer ‘tester cans’ you can take home and try before committing to large cans of paint or the effort of painting an entire room only to discover you don’t like the result. I often have clients that don’t want to paint, but think about it, you have incentive to paint, and yet some don’t want to do it. How does a buyer feel then? They may just pass up your home for the freshly painted one down the road. Buyers often dread the thought of having to paint as soon as they move in. It may not be a big deal for some of us, myself included, but a lot of people simply can’t see past a paint colour they don’t like. Don’t take me wrong, I’m not suggesting that every home needs to be painted before it goes on the market. That’s not the case. I realize it’s an added expense, so I only suggest it if I really think the paint is worn looking, or the colours need to be neutralized. I can often work with a paint colour to bring out the best in the room. When you’re selling you’re often in a bit of a rush to get your home listed. Hiring a professional painter can alleviate a lot of stress. What can take you a week or more they can accomplish in about two days. And they’re so good at it! Most home owners can’t match the job that a professional painter can do. ….and don’t forget to touch up any trim that’s looking worn!